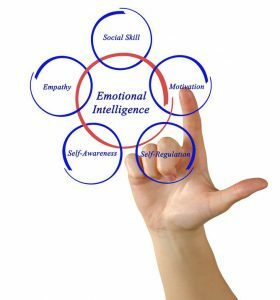 So what’s all this mumbo jumbo you keep hearing about Emotional Intelligence? Again … a key predictor of success. There are 100’s of online assessments that vary widely in statistical validity. Some organizations and consultants have created their own while other companies provide statistically valid assessments. So be careful what assessment you utilize. Our organization does provide EQ Assessments if you are interested please feel free to contact us. The good news is that regardless of what your Emotional Intelligence score is, you can always improve. Unlike other aspects of your self that can be difficult to change, Emotional Intelligence happens to be something you can improve with a little focus and intention. Pay Attention to Stress Triggers – Pay attention when your emotions are running high or you are shutting down in a situation. Before it goes on for too long, excuse yourself from the situation. Find a place where you can stop and take at least 5 slow deep breaths in through your nose, hold at the top of the inhale for 3-4 seconds, and then exhale slowly through your mouth (repeat 5 times) and then return to the situation at hand.